Your child’s guide to playing safely with dogs! Everyone loves the image of a child and a favorite pet dog. Many children say they love dogs, and claim that the dog is their favorite animal. However, it’s common for children to be hesitant or intimidated around dogs. Many fears and worries about interacting with dogs can be easily solved with some basic education about how to approach and interact with dogs of all kinds. A Day at the Dog Park introduces Carter and his dog, Snickers. 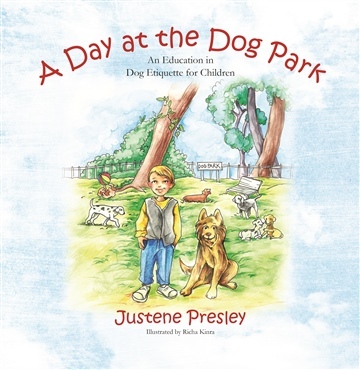 Carter’s mom takes them to the dog park, and their enjoyable day gives fun, practical lessons about the best way to make new dog friends. Carter explains that there are lots of different types of dogs, and goes through a six-step method for meeting a new dog. Each step is explained clearly, simply, and with plenty of detail, so readers can feel confident in their new skills. Carter also shares advice about what not to do. Children and parents alike will enjoy this charming, educational book, which is likely to become a favorite in your library!